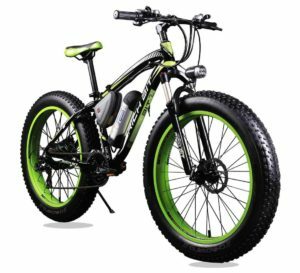 If you are in the market for buying an electric bicycle, then you will probably know that some of them can get very expensive. They are a great way to handle the daily commute, or help you with your ride in the country, but they don’t need to be expensive to get one that is well made. This list features the top three electric bikes that are under £1000. This nice looking bike from Cyclamatic (Learn More Here!) is well-made and packed with features. Despite this, you can get one of these at a very reasonable price. Let us see what features this bike has to offer. The large 17 inch wheels are ideal for anyone from 5 feet 5 inches to 6 feet 2 inches. The bigger wheels also help with stability and ride. It features a precise Shimano Tourney SIS gear system. You can select exactly the gear you need effortlessly. There are front and rear mud guards for comfort in wet weather and an adjustable seat for maximum comfort. The battery is a powerful Lithium-ion types that can give you a range of up to 45km. More than enough for regular cycling. Overall, the Cyclamatic Power Plus E-Bike has everything you would want from an electric bicycle, but without the large price tag to go with it. Another bike that has a lot of functions for its price is the West Hill Pro Terrain. Not only does it have a range of easy to use controls, it also has a high power battery for long distance travelling. Here are some of its features. The powerful 36 volt 10ah Li-ion battery can give you a lot of power over a long range. You can travel up to 60km at speeds of 25mph. This is very impressive for an electric bike. With three levels of pedal assist, you will be in complete control of your ride. You can choose from Low, Medium or High. The Shimano TX55 gear system offers precise gear changes with none of the clunking or grinding that other types can have. For added safety in the evening, the bike is fitted with front and read lights. The West Hill Pro Terrain Electric Mountain Bike is a reasonably priced product that gives you quality build and components. It will certainly offer many miles of happy cycling. This bike from Richbit looks ready for anything with its large tyres and sporty decals. It has all the features you would want, but at a competitive price. Here are some of its features. There is an amazing Shimano 21 gear shifting system that will make light work of any hill you may find. The 36 volt 350 watt hub motor will assist you when you need it. This together with the 21 gears, won’t leave you crawling along. It is fitted with fat 4.0 inch tyres to take the shock out of the terrain as well as give you plenty of grip. With a strong aluminium frame and front suspension, this bike will last for many miles. 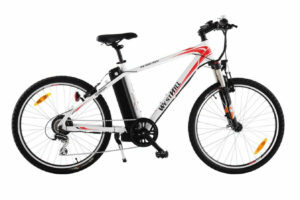 The Richbit RT-012 Ebike has a lot of nice functions for the price. It is strong, fast and safe on the road. Everything you need for a dirt track ride or the cycle to work. 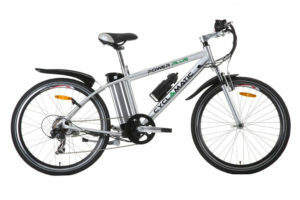 The top spot on the list goes to the Cyclamatic Power Plus E-Bike. It has a light yet powerful battery and lots of additional features. It will be ideal for anyone looking to buy this type of product.